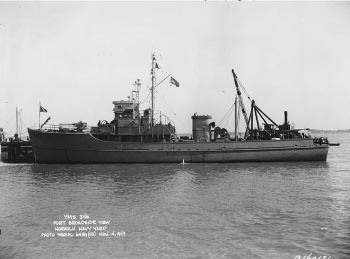 Dimensions 136' by 24'6" by 6'1"
Auxiliary Motor Minesweepers (YMS) were small wooden vessels equipped with gear for sweeping acoustic and magnetic mines in coastal waters. They were build in yacht yards and were not expected to operate except in proximity to their base. They were used to sweep mines laid by U-boats off the Atlantic coast, but later found a role sweeping Japanese mines in restricted waters of the southern and western Pacific.